Recently for a proof of concept I needed to supply a CRM installation installed to Microsoft’s best practices – i.e. a 2 server environment, SSL (HTTPS) and each service running under a separate service account. Here are some notes on what was required to make this work. UPDATE 2: If you are not able to run Fetch XML reports or Report Wizard reports (which are Fetch XML reports) then you are likely suffering a firewall issue as described here. Thanks to my colleague Farooq for finding this post and thanks Jim for writing it! This entry was posted in Uncategorized and tagged 2011, crm, install on November 14, 2011 by Gareth Tucker. p.s. I recently purchased a drive caddy that I can swap my DVD-ROM drive out for and an SSD drive and now run my VMs on the SSD and it is brilliant! I have a quad-core laptop with 8GB ram and I like to give my VM 4GB ram and 2 cpu’s. 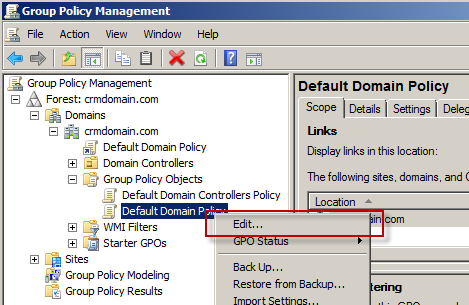 Optionally create AD accounts for the various CRM and SQL Services, or, just use the default domain administrator account or the network service account for everything. Optionally install Visual Studio, CRM SDK, CRM Dev Toolkit and 3rd party tools like the View Replicator, Ribbon Editor, oData Query Designer, Metadata Browser, etc. 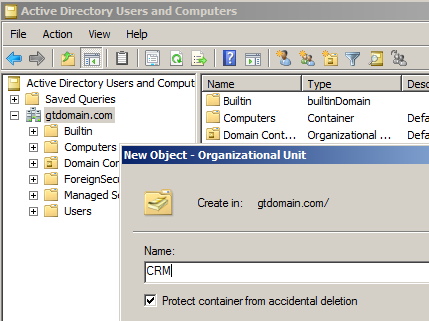 This entry was posted in Uncategorized and tagged 2011, crm, install, vm on July 27, 2011 by Gareth Tucker. Ok, here is post #3 on command line installs, this time I will be covering the Outlook Client. The Outlook Client installer can be downloaded from here. Download it and run it to extract out the installation files. The files will be extracted and then the installer will launch, cancel the installer at the first opportunity. Place the extracted installation files in a shared folder on a server somewhere. There are 2 different approaches you can take with the Outlook Client installer. 2) You can execute a command that will generate an MSI installer for you to later deploy out to client PC’s. Full details on what this all means can be found here. Now we don’t actually need a config file this time around, everything can be specified in the command line. It is important to understand that the installation of the Outlook Client and the configuration of the Outlook Client to point to your CRM Server are 2 separate steps. All we are doing at this stage is installing the Client. If your install fails have a look at the log file created. If the issue is not clear you can try re-running the install with /LV rather than /L which will give you verbose logging. This approach is not that different from the first, we are still executing Setupclient.exe at the command line but this time nothing is actually installed, instead an installer is created. I guess you just go this way if you want an MSI file. Setupclient.exe /A /Q /L C:\crm_client_install.log /targetdir "c:\Program Files\Microsoft Dynamics CRM Client"
Here we have added /A to indicate we want to create an admin installer and we are specifying a target directory for where the installer should be created. So run the command, check the log file until you can see the process has completed and then browse to the target directory. There you will see an MSI has been created and the install files have been copied to an accompanying folder. 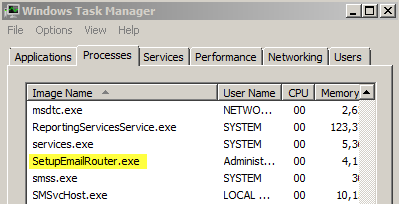 The command line provides no indication of processing, but check Task Manager and the log to see whether the configuration is running or not. If no log file gets created or the log indicates error trying running the command without the /Q to see what’s going on. 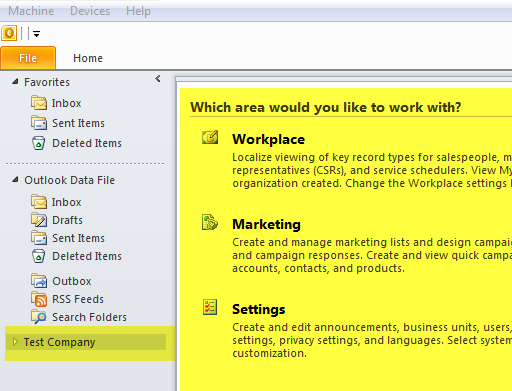 This entry was posted in Uncategorized and tagged 2011, config, crm, install, xml on July 25, 2011 by Gareth Tucker. In my previous post I went through the command line install of the CRM Server component. 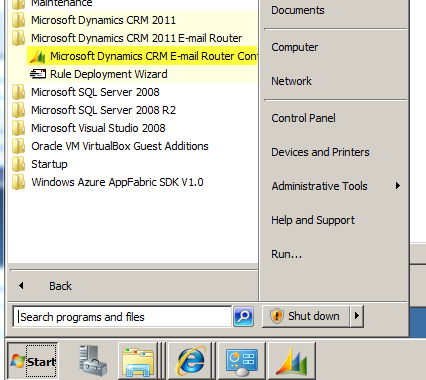 The Microsoft Dynamics CRM Email Router. Firstly, don’t confuse the Microsoft Dynamics CRM Reporting Extensions with the Microsoft Dynamics CRM Report Authoring Extension. 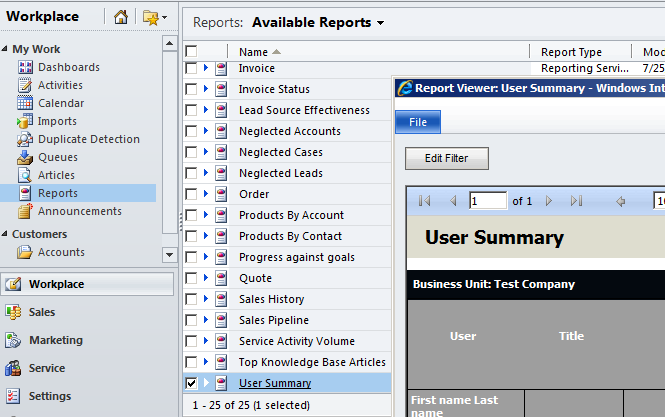 The Reporting Extensions is the integration component between the CRM Server and SSRS, it was known as the SSRS Data Connector under CRM 4.0. It used to be optional, now it’s required. The Authoring Extension is an add-on to the SSRS Report Designer that allows you to write custom reports against CRM Online (it enables FetchXML data sources / queries). It is optional. You’ll need to open a command prompt and navigate to the SrsDataConnector subfolder inside the folder containing the CRM Server install files. The rules are all nice and consistent with the CRM Server install command line and config file as discussed in previous post. Once complete, you can test the installation by trying to run a CRM report. There are errors in the samples provided, use my samples instead. On to the Email Router. The Email Router is the optional server side component for email integration. It is typically used to configure outbound email sends via an SMTP server and inbound email processing via polling of Exchange Server mailboxes. 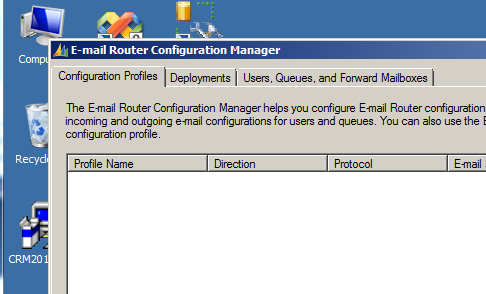 The Email Router can be installed on the Exchange Server, CRM Server, SQL Server, anywhere. Typically, it is installed on the CRM Server. Inside the Features node under SinkService you can add RulesWizard if you want the Rule Deployment Wizard installed (I never use this hence my sample excludes this). [UPDATE: Looks like the Rule Deployment Wizard gets installed regardless]. If you are downloading your CRM installers from the web rather than installing from a disc or an ISO you will need to separately download the Email Router installer from here. I downloaded from there, started the installed by double-clicking the exe in Windows Explorer, set the location for the extracted installer files, and then cancelled the install at the next prompt. I then opened a command prompt and navigated to the extracted installer files and ran my command. The 2 config files discussed in this post plus the config file for the CRM Server install discussed in my previous post are available as a single download here. This entry was posted in Uncategorized and tagged 2011, config, crm, email router, install, ssrs, xml on July 25, 2011 by Gareth Tucker. You will need either the CRM server installer (CRM2011-Server-ENU-amd64.exe) available here or the CRM install media. If you have the CRM server installer run the exe to extract the install files. If you have the install media then I think the install files are already extracted out. Place your config file in the folder specified, and make sure the name matches up. You can use either /QR or /Q. The “R” gives you visibility of progress and errors. If you want more visibility of what’s going on drop the /QR from the command line. You will see each installation step, with the screens pre-populated based on the config file, but will need to click through each screen to nudge the process along. Handy for troubleshooting. If the installer fails check the log file, I found it clearly pointed out the environmental issues that I needed to address (like forgetting to create the OU and not having SQL full text search installed). AsyncServiceAccount – The Microsoft supplied sample found on technet has a typo here. mu option="true" – Again, Microsoft has another typo. IncomingExchangeServer – whether using Exchange or not make sure an actual server name is entered here (I entered the name of the server I was installing CRM on). If the installer can’t find the server the install won’t proceed. Everything else should be pretty obvious. That will get you started. There’s the email router, SRS data connector, rollup packs etc to do as well. Good luck! The config file is available for download here. Depending upon your environment some of the prerequisites auto-installed by the CRM installer may need to be manually installed prior to executing the command line install to enable success. This is due to restarts being required in between installation of certain prerequisites. The log file provides clarity around this when it happens. This entry was posted in Uncategorized and tagged 2011, crm, install on July 22, 2011 by Gareth Tucker. “Cannot register the hard disk XXXX with UUID YYYY because a hard disk XXXX with UUID YYYY already exists in the media registry blah blah …"
And you’re ready to rock. Launch Virtual Box, create a new machine, when asked to select a hard disk browse out to your VDI file and select it and then you should be all good. I’ve had to figure this out twice now and mucking around in a command prompt quickly drives me nuts so next time I’m coming back to this blog. This entry was posted in Uncategorized and tagged crm, install, Virtual Box on July 22, 2011 by Gareth Tucker. US-based, New Zealand born, Microsoft CRM Practice Lead for Avanade's Northwest region in the United States. Specializing in Dynamics CRM delivery since 2005.